With its sunny beaches, world-class shopping, and delicious local and Asian cuisines, it’s no wonder that families flock to the island of Oahu in Hawaii. The island offers a variety of lodging options for families looking to experience everything from the hustle and bustle of Waikiki to the legendary waves of the North Shore. Read on for our best hotel picks for families in Oahu. Beyond having the best family pool on the famous Waikiki Strip, the Sheraton Waikiki offers fun activities for kids in a family friendly setting. Daily lessons in Hawaiian culture are included with your resort fee and will have your kids playing the ukulele, making leis, and dancing the Hula in no time. One of the biggest draws to staying at the Sheraton Waikiki is the location. It’s one of the few hotels located right on the beach in Waikiki giving you the option to explore blocks of shopping and restaurants or stay put and enjoy life on the beach. When you are done exploring, head to the Helumoa Playground family pool where kids have access to a kid’s pool, fountains to play in, two waterslides, and two fresh water pools. Best of all, due to an incredibly nice edgeless adult-only pool overlooking the ocean, you’ll find plenty of space to stretch out and enjoy the family space without the usual crowds Waikiki is famous for. Read full reviews from families on Sheraton Waikiki. Looking for more fun? Read Oahu Hot Spots! Must See Activities with Kids. The Halekulani Hotel has received five stars from reviewers who not only loved the beach location, luxurious rooms, and spectacular ocean views but also the family friendly vibe of the hotel. The staff is incredible with kids and are even known to play hide and go seek to show kids some of the fun aspects of the bedrooms. At Halekulani, families can experience the best of Waikiki without ever leaving the hotel. House Without a Key, the poolside restaurant, offers kid-friendly dining, delicious virgin concoctions for kids, and even Wikki Stix, fun wax sticks for them to make their own creations while they wait. The nightly entertainment at House Without a Key offers some of the best entertainment Waikiki has to offer. Former Miss Hawaii winners dance the Hula but also take the time to chat with families and take photos. The pool is big enough that you won’t worry about your kids bothering other people and warm enough that you’ll swim longer than expected during the winter months. Head out of the pool gate to the beach where you are more than likely to see sea turtles frolicking in the surf in the late afternoon and early evening. For more on where you can see sea turtles, check out the best beaches to see sea turtles in Oahu for free. Read the full reviews from families on Halekulani. Finding affordable hotels can sometimes be tricky, particularly in Waikiki, Oahu. 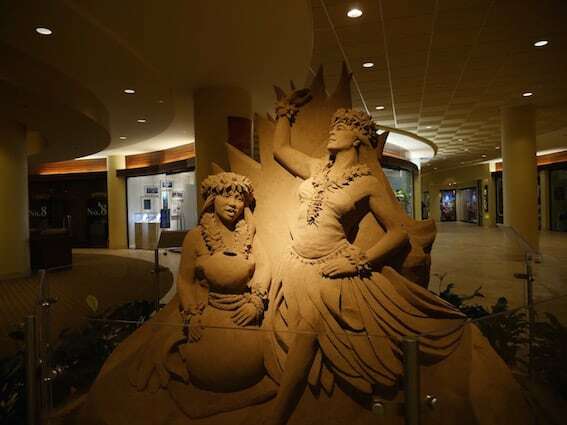 Trekaroo families have found that the Aston Waikiki Beach Hotel is the best option for sand, sun, and surf on a budget. The hotel has great free amenities like a PS3 console and Blu-Ray player with free game and movie rentals to keep kids busy at night. 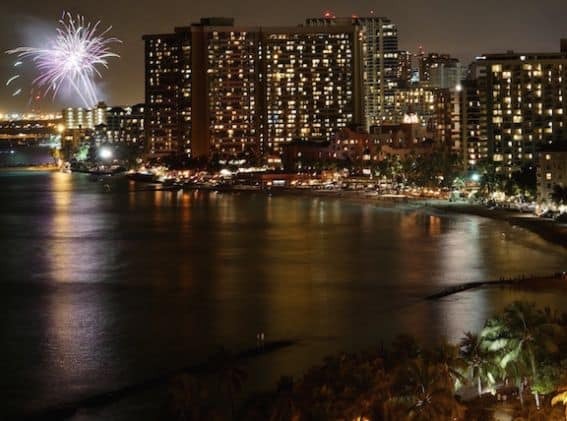 Stay on a Friday for a great view of the weekly Waikiki fireworks from your hotel balcony. The pool is smaller than other more expensive hotels but the location more than makes up for it. Simply cross Kalakaua Avenue to arrive at Kuhio Beach, a kid-friendly beach protected from larger waves by a breakwall. Also within walking distance are kid-friendly activities like the Honolulu Zoo and Waikiki Aquarium. Read full reviews from families on Aston Waikiki Beach Hotel. Families traveling with kids can often benefit from hotel loyalty points. There are few hotels that can offer perks comparable to those at the Hyatt Regency Waikiki Beach. Here, loyal Hyatt Members converge in the Regency Club Lounge located on the 3rd floor of the hotel. Families have access to the club 24 hours a day, with meals, beverages, and snacks being served throughout the day. What makes the club different is the large patio with couches, tables, and firepits. Feel the heartbeat of Waikiki each night without dealing with the lines and crowds on the street below. Even without club access, this hotel is perfect for families. 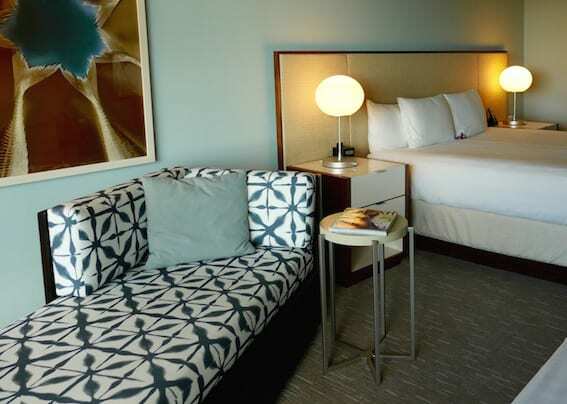 Newly renovated, clean, and modern rooms welcome families who want to lounge in comfort. The pool deck has a large and family friendly hot tub and pool where inflatable floats and toys are welcome. Pool side service is quick and efficient. Read full reviews from families on Hyatt Regency Waikiki Beach Resort & Spa. Oahu’s North Shore is famous for it’s larger waves and laid back vibe. Located only an hour from the Honolulu Airport, Turtle Bay Resort is a world away from Waikiki. Families love to head North to experience the surfer lifestyle that the North Shore is known for. From the shores of the resort, families sit and marvel at the talent of local surfers and paddleboarders as they tackle the large waves with ease. Turtle Bay Resort has an enormous number of activities perfect for families. 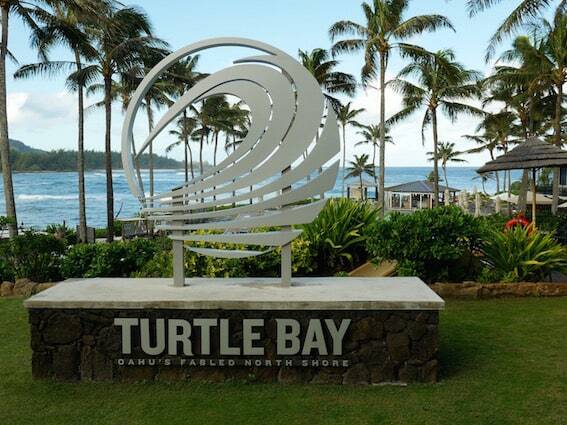 From learning to surf with a dog to free hiking on one of the resort’s many trails, there is always something to do at Turtle Bay. Book any activity through the resort and they will even lend you a Go Pro to record your adventures. Read the full reviews from families on Turtle Bay Resort. For families looking for a complete resort experience in Oahu, there is nothing comparable to Aulani, A Disney Resort and Spa. Standing tall above the calm waters on the shores of Ko Olina, Aulani is a good mix of Hawaiian culture and Disney magic. 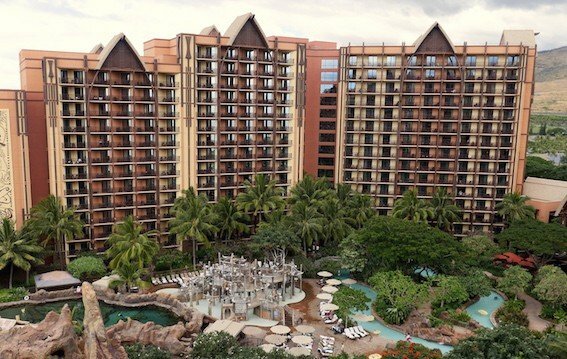 Don’t expect the same level of Disney as you would get at a Walt Disney World Resort but instead, an integration of the brand into a Hawaiian hotel stay. The rooms come with kitchenettes that include fridges and microwaves, and there are plenty of dining options onsite to meet your needs. The Waikolohe Valley pool area has two large waterslides, a fun lazy river, and several pools and splash pads. There is even Rainbow Reef, a snorkeling lagoon filled with tropical fish. Each day, Goofy can be found frolicking in the water and leading pool games for kids. Families will also love the included kids’ club, Auntie’s Beach House. Here, kids can play in several themed rooms or on the playground in Auntie’s backyard. Scheduled events happen daily including the Ka Wa’a Family Luau and science sessions with Stitch. Pre-registration is required and spaces fill up quickly. Read full reviews from families on Aulani, A Disney Resort and Spa. Heading to more Hawaiian islands? 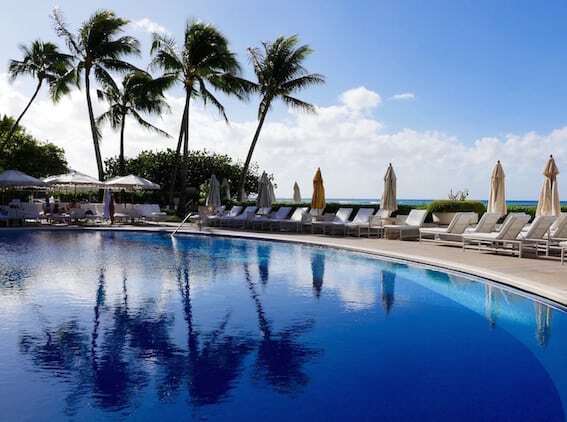 Check out the best hotel pools in Hawaii. Wow! This list is amazing, Sarah! Thanks for giving us such a wonderful list of the best hotels to stay. As I’m a person who keeps on traveling and exploring places, this would definitely be helpful to me. I am glad that you shared this!